I was strolling through Michael's the other day and I found a really cute planner from Me and My Big Ideas. I had a coupon burning a whole in my pocket, so I decided to purchase it and see what this planner thing is all about. It didn't take long to become totally addicted to decorating my planner with all of the cute stickers and embellishments that they sell to coordinate with the planners! I'm about three sticker sheets away from an intervention or divorce! I have decided to make my planner more of a memory keeping photo planner with images that I add during the current month in addition to the appointments etc. I will enjoy keeping my planners in the future and looking back on what was happening in our lives during this time. 4. 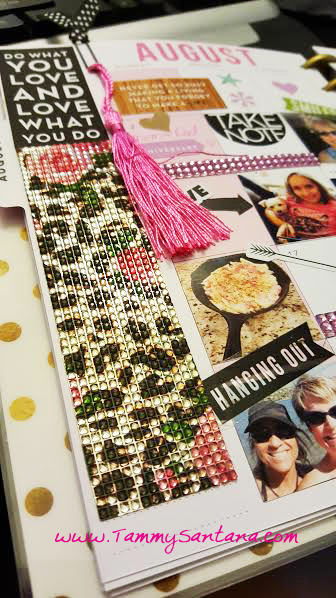 A cute tassel that I attached to a ribbon embellished paper clip. 5. Studio G and Sharpie markers to write in my planner. 7. My Xyron machine to attach all of the photos on the page. 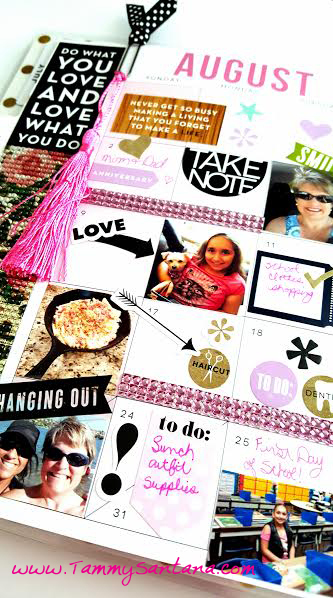 First Day Back To School Free Printables! Copyright Tammy Santana, Inc. 2016. Awesome Inc. theme. Powered by Blogger.